Today I will try and answer some of the most asked questions that I hear when couples reach out to us. How to choose location for ceremony? Choosing location is the next step after booking your beach wedding package. Start with looking over locations that we recommend in our Panama City Beach Wedding Guide. If you like one of them then your search is done. If not simply contact your coordinator and she will email you more options based on where you will be staying or any other preferences. Do we have private locations in Panama City Beach, Florida? No-one in the area has private locations on the beach. If another company promises you that it is simply not true. We know most private areas of the beach, but still they can not be classified as private. 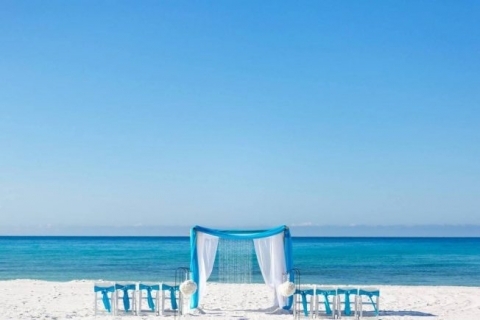 Are there any fees with having ceremony on the beach in Panama City Beach? This depends on the location you pick. Most beaches in Panama City Beach, Florida do not charge fees. Exceptions are beach houses (some owners charge a small fee), some hotels, and St Andrews State Park requires an entrance fee for each car. Hope this info helps with planning your destination wedding here in lovely Panama City Beach, Florida.